In January, WayTools announced the TextBlade, a compact, collapsible keyboard for iOS devices and Macs that's quite unlike anything else that's available on the market. 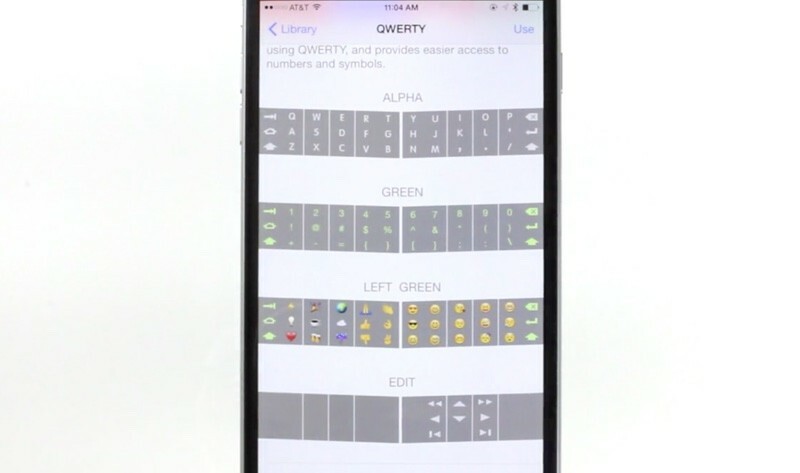 It replaces a full keyboard with eight large smart keys that take advantage of multilayering, giving users access to a complete set of keys and commands on a keyboard that fits into a pocket. WayTools began accepting pre-orders for the TextBlade at that time, garnering a huge amount of interest from people who were excited about the promise of a better mobile keyboard. The company initially planned to ship in February, but as customers who pre-ordered know, the TextBlade has yet to ship, having faced unforeseen production problems that led to a series of design tweaks. I visited WayTools in Santa Monica in March and was able to be one of the first people to see the TextBlade in person, give it a try, and watch it in action. The post that I shared of my experience garnered a huge amount of interest from MacRumors readers and other people curious about the TextBlade, and since then, I've been asked by readers on multiple occasions to share an update about what's going on behind the scenes at WayTools to cause the shipment delays. As of today, I'm able to provide an update, following multiple conversations with WayTools' CEO Mark Knighton, where we walked through the delays and went over some of the new features that have been added to the TextBlade since January. WayTools will be publishing an in-depth blog post that goes into even more detail on the problems the company faced with production, and I'll update this post to add a direct link as soon as it's live. Before launching pre-orders, WayTools did production runs and quality tests on the TextBlade and the parts ready to go, but transitioning from testing runs to mass production can expose unforeseen issues. With mass production, a product that might have been assembled by a small team is now put together in parts by a huge number of workers and if the production process isn't streamlined to the minutest detail, you're not always going to get a consistent product. "In large volume, you expose all the subtleties," said Knighton. "You test like crazy, but actually doing large volume shows all the flaws." When production picked up on the original TextBlade after pre-orders began, WayTools noticed some variation in the butterfly mechanism of the finished keys. The butterfly is an integral part to each TextBlade key because it's ultimately responsible for the feel of the keyboard. The way the keys feel under the fingers is arguably the most important aspect of any keyboard, so this was important to get right. WayTools built a better, stronger butterfly out of liquid crystal polymer (LCP). Those of you who read my original hands-on with the TextBlade might remember that I was able to feel both the old TextBlade and the newer model with the revamped butterfly. There was nothing wrong with the feel of the old TextBlade, but the version with the LCP butterfly was simply better - more satisfying to press. Liquid crystal polymer butterfly mechanism underneath the TextBlade's keys. Redesigning the butterfly led to a host of other problems that had to be solved. The LCP material was much stronger than the material of the original butterfly, causing minor deformations to the keycaps whenever a key was snapped into place. WayTools wrote an extremely detailed post on the LCP butterflies and the issues they caused in May. At that time, the solution to fixing the deformation (which could shorten the life of the TextBlade) was a new tool that was used to snap the keys in place while protecting the keycap. The tool ended up being an imperfect solution because it added friction to the assembly process. 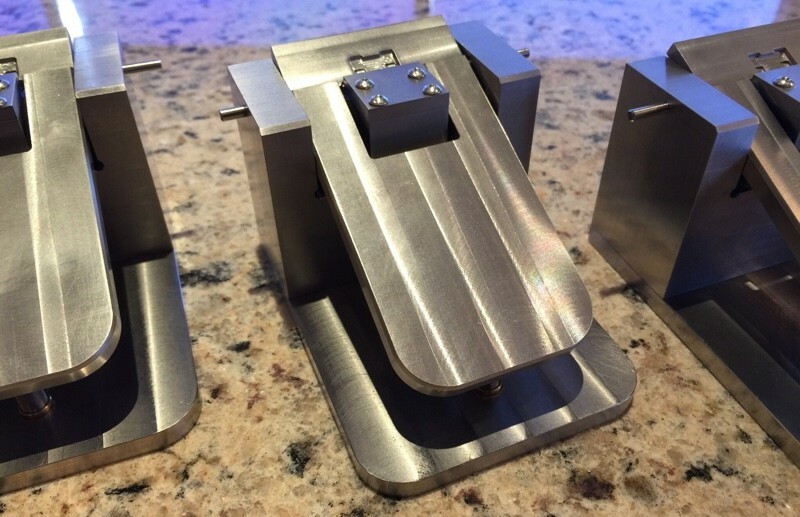 Even with the tool, there was variation in the end result, so WayTools' engineers had to go back to the drawing board to come up with a better solution. Original solution to fix the deformation caused by a stronger butterfly mechanism, later scrapped for an improved fix. Instead of creating an entirely new mold, the engineers found that milling 0.3mm from the inside of the keycap to change the shape of its butterfly retainer ledges fixed the problem. The material of the original butterfly required a sloped shape for a proper fit, but with the stronger butterfly, the sloping was unnecessary, so it's being removed from each and every already-made keycap by a machine. This solution worked out well because the keycaps can now snap on and off with no damage caused to the underlying base, and the milling process is more precise than molding. "We didn't know we didn't need the slope and we didn't know we could eliminate it," said Knighton. "But in testing we discovered that. Multiple engineers focused on alternative solutions trying things until we fixed the problem. We gained all the benefits with no deficits. The first tool took a lot of work, but it just wasn't good enough and the end result is better than ever." Another butterfly issue was discovered later, when some of the TextBlade keys were sticking due to thermal changes. In the extreme cold, it was found that the polymer the base of the TextBlade is made from shrinks slightly, while the butterfly does not. That required another engineering change, milling off an 80 micron rib from every single key. Another small modification to the TextBlade base to prevent keys from sticking during thermal changes. As a quick aside, there's also a minor modification that's made to each of the butterflies before they're added to the TextBlade. Each one is placed within a fixture to fine tune travel and further cut down on variation between keys. Each key has exactly 2mm of travel with a +/-0.10mm margin of error using this method, which was created when all the other key revisions were happening. Every butterfly goes in this machine to make sure size is uniform for an identical feel to each key. "The liquid crystal polymer is the right way to make [the butterfly]," said Knighton. "I wish we could have had that data six months earlier, but we didn't. We should have thought of it earlier, but we didn't." While revisions were happening with the keys, there was a separate problem that impacted the Spaceblade. The TextBlade is composed of three main pieces: two Keyblades and the Spaceblade, which also houses the battery. The Keyblades snap to the Spaceblade via magnets. The two Keyblades pictured above attach each other and to the Spaceblade (which houses the battery) using magnets. This connection supplies power to the TextBlade's three components. Each piece of the TextBlade goes through several test runs and quality checks to make sure there are no problems, and intensive testing on the magnets began well ahead of when pre-orders took place in January. 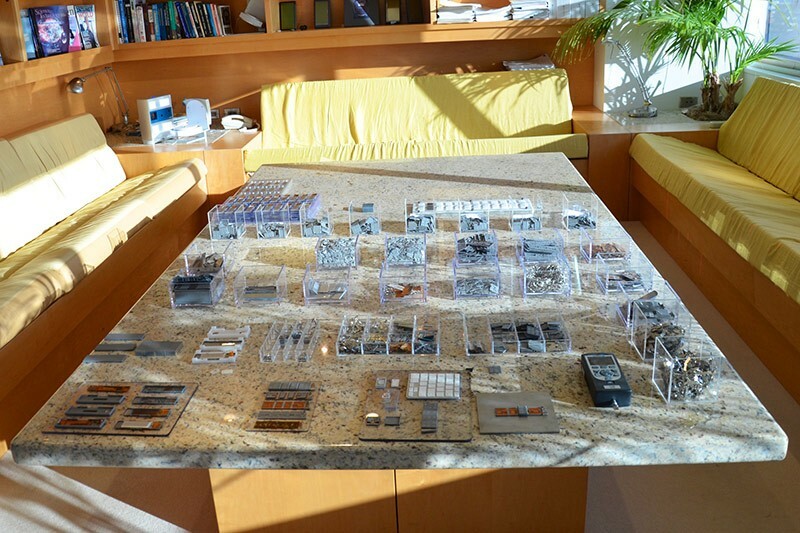 Several test runs resulted in perfect magnets, leading TextBlade to place a much larger order for magnets from its supplier, which were then held for assembly. Thousands of Spaceblades were assembled using the magnets and when further testing was conducted on some of the finished product, WayTools discovered a latent defect. A single batch of magnets didn't get a proper plating, leading to oxidation and corrosion on some of the TextBlades being tested. Visually, there's no way to tell a defective magnet from one that has the right coating, so all of the magnets had to be scrapped. There's no way to swap out a magnet on a Spaceblade, so every one made from the first set of magnets was unusable, and a second backup magnet order had a separate problem. "We had a two point failure in magnets," said Knighton. "We planned this, then ran into double failures. There are some simple things that you thought your homework was done for. You thought you did this job. You did this work last year, it was vetted, put on the shelf, and son of a gun there's a latent failure." WayTools encountered several other production problems, including a major mistake with its circuit boards and a long certification process, all of which will be detailed in the aforementioned blog post. It's going to be well worth a read for anyone curious about the work that goes into making sure hundreds of different parts are manufactured properly to create one functional product. With software, bugs can be patched, but with hardware, there's one shot. 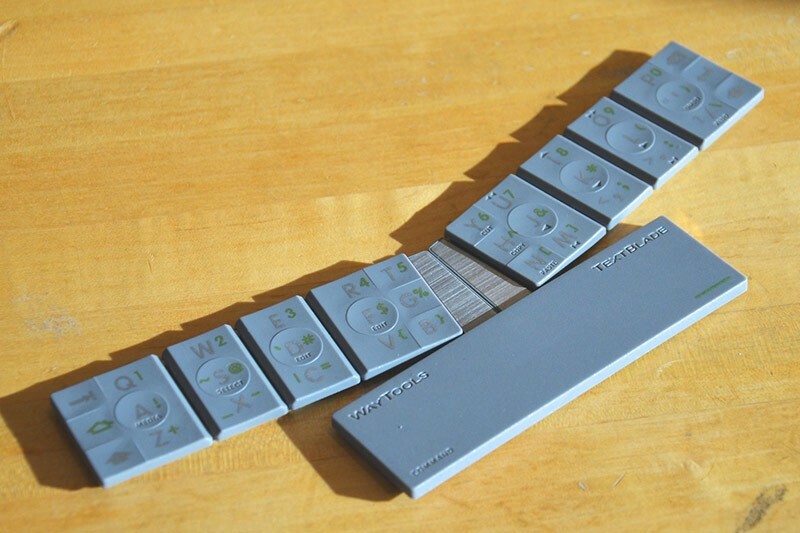 If one part out of the 300 that goes into the TextBlade has a latent issue or a problem, the TextBlade can't go out. At many points during production, there were problems that could have been swept under the rug and fixed in a later iteration, but the WayTools team has a high standard for its first run product and doesn't plan to compromise on quality for the sake of getting a product out faster because a flaw could "spoil the magic," as Knighton says. "We don't want to make people upset," said Knighton, "but at the same time, you've got to rise to the standard. You have to be at that level. You have to be meticulous about that stuff. You have to insist everything is right." While hardware issues were being solved, WayTools didn't sit idle. Along with solving engineering problems, the WayTools team has made several improvements to the software that powers the TextBlade to improve its functionality. The MultiMap software and the iPhone app for the TextBlade are nearly complete, and WayTools has outlined how they work in a new blog post. The TextBlade app lets the TextBlade receive firmware updates and custom keymaps, created using MultiMap. MultiMap lets users assign any key to any location, switch between languages, share key maps with other users, and create macros. Check out the video on the WayTools site to see it in action. WayTools has also introduced some significant software updates to make the user experience better for those who want to replace a desktop keyboard. ModKeys brings full access to modifier keys like Control, Alt, and Command to the TextBlade in a clever way. Holding down two keys on the bottom row of the TextBlade allows them to act as modifiers. For example, holding down C+V on the left side of the keyboard works as a Command key, while holding down X+C acts as an Alt key. Modifiers can be combined, so holding down X+C+V acts serves as an Alt + Command function, as can be seen in the video on the WayTools site. 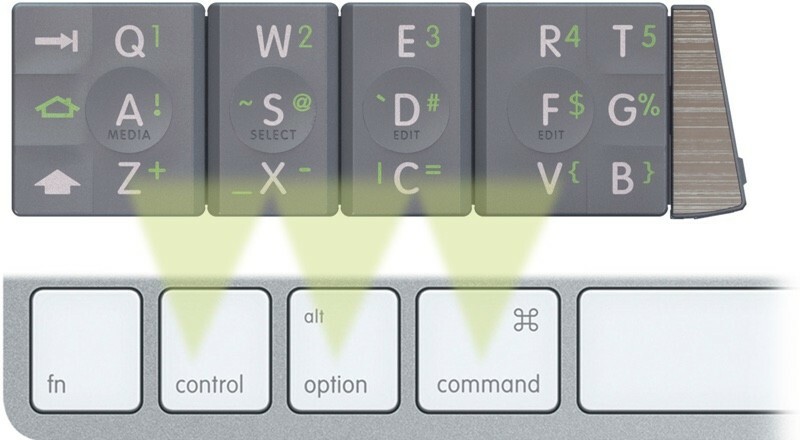 The right side of the keyboard functions the same way, so for a standard shortcut like Command C for "Copy" on a Mac, you would down "M" + "," on the right side and "C" on the left side. These keys are in the same general location as the modifier keys on a standard keyboard so placement isn't difficult to learn, and it results in a lot less hand movement on the keyboard. All of the production problems that were outlined above have now been fixed. WayTools has a selection of release candidate TextBlades at its headquarters in Santa Monica, and those TextBlades are currently undergoing testing to make sure there are no other issues that need to be dealt with. If those release candidates successfully pass WayTools' testing, they will be the first units to ship out to customers. Testing is expected to be completed on July 10 and should everything go well, that's when initial shipping will begin. Like all of WayTools' prospective shipping dates, July 10 is an estimate. "The checklist has to be finished. If there's anything we look at and say [the customers] aren't going to like that, we've got to fix that first," said Knighton. "We believe [the TextBlade] is not another gadget. It has to be done right and we think people will appreciate that." While the TextBlade release candidates are undergoing testing, the company's manufacturing partners in Malaysia are working on massive numbers of TextBlade parts to prepare for volume shipping - milling the ribs that could cause the keys to stick in the extreme cold, milling the inside of the keycaps for the butterflies, and installing sound dampeners to account for the extra clicking that was introduced with the LCP butterfly. 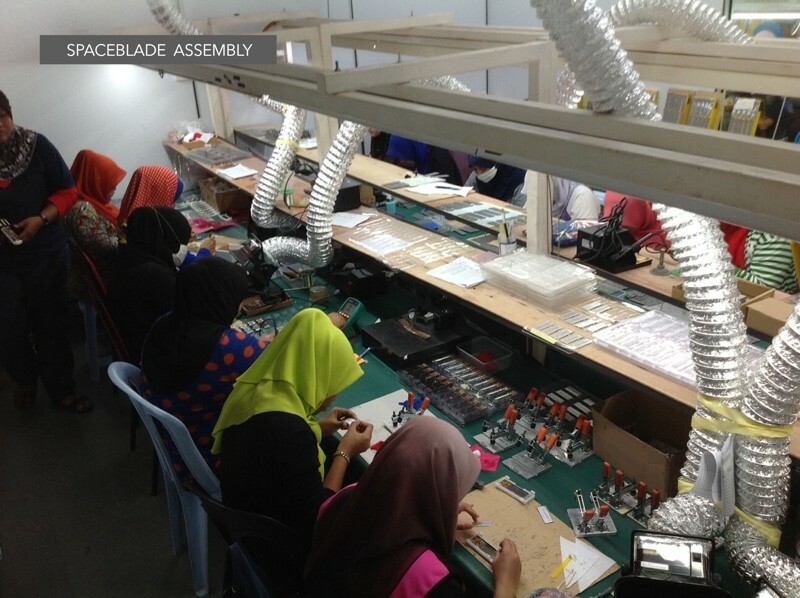 A handful of the more than 50 factory employees working to assemble TextBlades at WayTools' partner factories. Once the first release candidates go out and the TextBlades have all the kinks worked out, shipments will accelerate quickly. 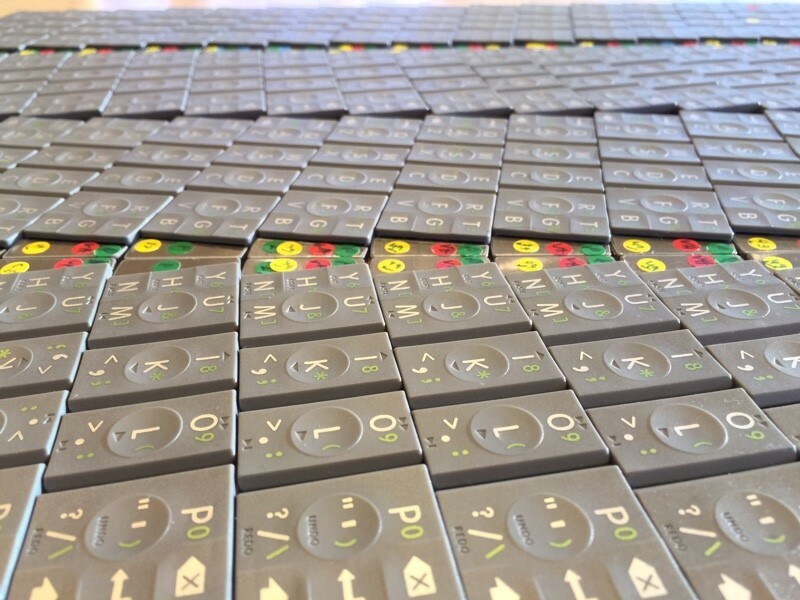 The WayTools team is hoping volume shipments will begin at the end of the month and is focusing all of its attention on getting TextBlades out as soon as possible. "We worked so hard on this thing. We use it. We know the impact. We want to ship it," said Knighton. WayTools is working to get existing orders out the door and orders will ship out to the earliest pre-order customers first. Customers who are ordering today will not receive their TextBlades until existing orders have been fulfilled, so the wait for new orders may be up to three months. The WayTools team understands that this is a long time to wait and that there are customers who have been waiting many more months for a TextBlade, which is why there are multiple perks for early adopters. Customers who pre-order will receive the MultiMap software for free and will receive a surprise gift, with the customers who pre-ordered the earliest getting the most substantial gift. The most important early adopter perk is a FutureProof Guarantee. If WayTools makes any changes to the TextBlade design during the next year, customers can do a one time swap on their old TextBlades and trade it in for a new model. Pre-order perks will only be available until the first TextBlades begin shipping out, so they may be ending soon. The TextBlade can be pre-ordered from WayTools for $99.